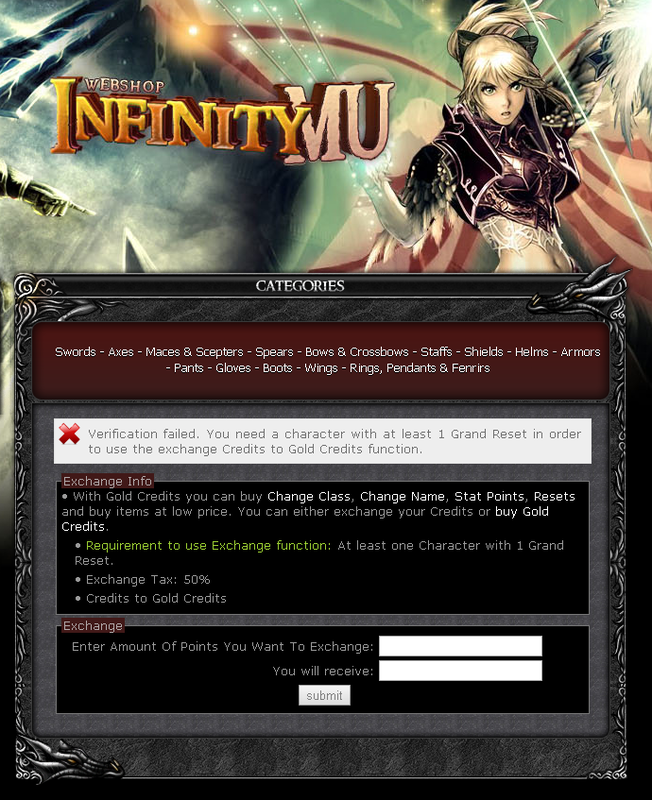 Requirements for voting and exchanging credits to gold credits has been updated! Reason for the update is to decrease frequent multiple account voters. Their only purpose is to earn more credits and buy items or winds but not actually help and vote for the server. Those players with legal votes whom might be affected by this update please accept our apologies and please go and make your character at least one Grand Reset to continue voting for our server. Thanks for your support! This way will help us be the № 1 server and we will continue updating and maintaining the server in future! Without you this adventure will not continue longer! Second Web update is concerned about our WebShop - exchange Credits to Gold Credits function. Like back in the old days we set permissions to accounts whom characters have at least one grand reset to be allowed exchanging Credits to Gold Credits. We are now bringing back this requirement because almost 5 months passed since the rankings renew! This means from now you will need at least one Grand Reset to exchange your Credits to Gold Credits. The reason is same as Vote Reward update. • Requirement to use Exchange function: At least one Character with 10 Resets. • Requirement to use Exchange function: At least one Character with 1 Grand Reset. We are so lucky to have an ADMIN like you, This proves that this server will stay alive for GOOD / Keeping it - Alive means IMMORTALITY. We would like to extend our appreciation for the amazing work done by you / your TEAM. The endless hours that you have spent working just to improve this server and making us number one in MU WORLD. The professionalism that you have shown has impressed the entire gamer's immensely. This is an inspiration for us Gamer's to reach at least 1 Grand reset and for us to do our part and to help this server in reaching our goal. owh i see sir RESiS thats why i cant vote for now hahaha ..
well its good for the sake of our server and to avoid those fake votes .. Sad, i’m too busy. But its ok i will try 10 reset everyday until i make it 100 reset. 100 reset = 1 Grand reset? First of all, thank you very much for your support. It's nice that you and your staff care about this community. You have my respect.